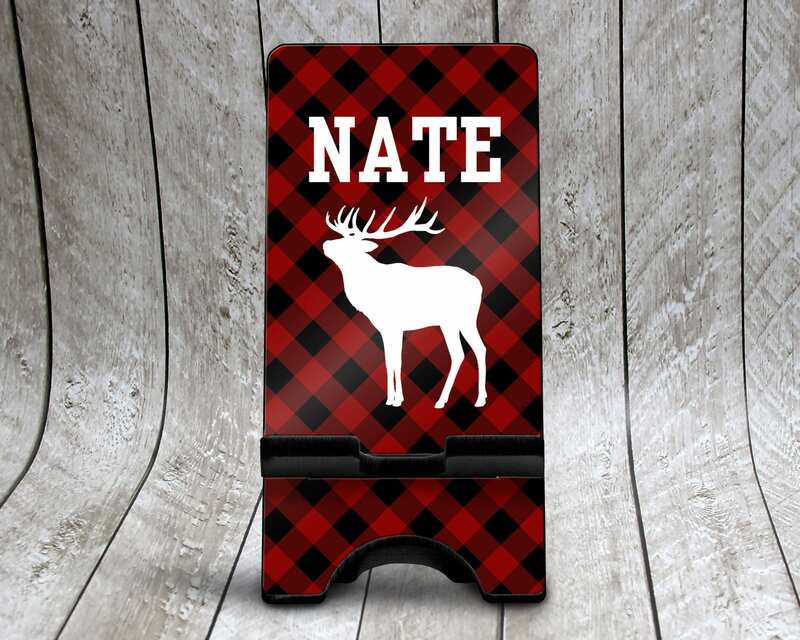 This phone stand features a black and red buffalo check plaid with your choice of name added in white along with a white elk shape. This stand comes in two pieces which assemble easily to create your custom phone stand. This phone stand is available in two sizes, small and medium. Custom made to order just for you, this is a great gift for any number of special occasions; graduations, birthdays and wedding part gifts. Each design is professionally print so it will not fade, peel or rub off. All printing and assembly is done "in house" so we can ensure you receive the very best in service and quality. Have something different in mind? We'd love to assist you with a custom request, just let us know what you have in mind. I am physically located within the state of Alabama. All orders shipped within the state will be charged appropriate state sales tax of 4%. Please note that as sales tax requirements have changed, a number of states are collecting sales tax at the point of sale. This is done automatically through the system and can not be altered. I do not receive this tax but it is remitted directly to the appropriate state. Yes, I do. I'm happy to ship anywhere around the world. For items that require international shipping, please be aware that customs forms will be accurately marked. I can not mark any items as "gift" or change the valued amount. The buyer is responsible for any taxes or duties imposed by their country on import. Are your items available wholesale? Yes, I do offer some of my items at wholesale prices to stores that wish to carry them. Please note that wholesale availability can vary by product. I do require the wholesale party provide proof of an established business and I require a minimum opening order of $100. Will the colors on screen match the item I receive? I do my best to make sure all items are represented as accurately as possible to ensure that there aren't any surprises when the item arrives. However, please keep in mind that colors can look different from monitor to monitor and from device to device. If you have a questions about any specific color, I'm always happy to assist. Do you make everything you sell here? Yes, everything is made by me. The steps can vary from item to item but each is made and/or personalized "in house". All items come directly from me to you to ensure you receive the highest quality possible.